Submitted photo Owners Jeff and Lisa Shumway cut the ceremonial ribbon-cutting with help from Beavercreek Chamber of Commerce representative Brian Jarvis, Beavercreek Mayor Bob Stone and Greene County Commissioner Tom Koogler. BEAVERCREEK — Local public officials were on hand for the June 16 for the grand opening of the first Club Pilates in the area. Owners Jeff and Lisa Shumway were assisted in the ceremonial ribbon-cutting by Beavercreek Chamber of Commerce representative Brian Jarvis, Beavercreek Mayor Bob Stone and Greene County Commissioner Tom Koogler. The new club is located on Lakeview Drive across from the Fairfield Commons Mall, in the complex with Hobby Lobby and Aldi’s. The studio is already beginning to show signs of a family business, with two Shumway daughters, Kayla and Tara, helping Club Manager Bethany Skelton with the preparation and opening. The Shumways are longtime residents of Beavercreek and were encouraged by the reception and have plans for two further Club Pilates studios in the Greater Dayton area. Club Pilates currently has more than 350 locations in 37 states. 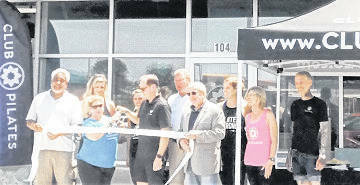 For more information on Club Pilates Beavercreek call 937-365-2929.
https://www.beavercreeknewscurrent.com/wp-content/uploads/sites/49/2018/06/web1_Pilates.jpgSubmitted photo Owners Jeff and Lisa Shumway cut the ceremonial ribbon-cutting with help from Beavercreek Chamber of Commerce representative Brian Jarvis, Beavercreek Mayor Bob Stone and Greene County Commissioner Tom Koogler.